This entry was posted on 26 September 2011 at 11:56 and is filed under Breakfast, Fall, Homemade and preserves, Summer. You can follow any responses to this entry through the RSS 2.0 feed. You can skip to the end and leave a response. Pinging is currently not allowed. I was at Bergamot restaurant Cambridge MA and had Plum ginger jam served with artisan cheese- OMG it was wonderful! I am back home in CA so I am trying this recipe! Thanks Nina, it may well be my absolute favorite jam. I’ve not had it with cheese but this gives me some ideas. Hope you enjoy it! 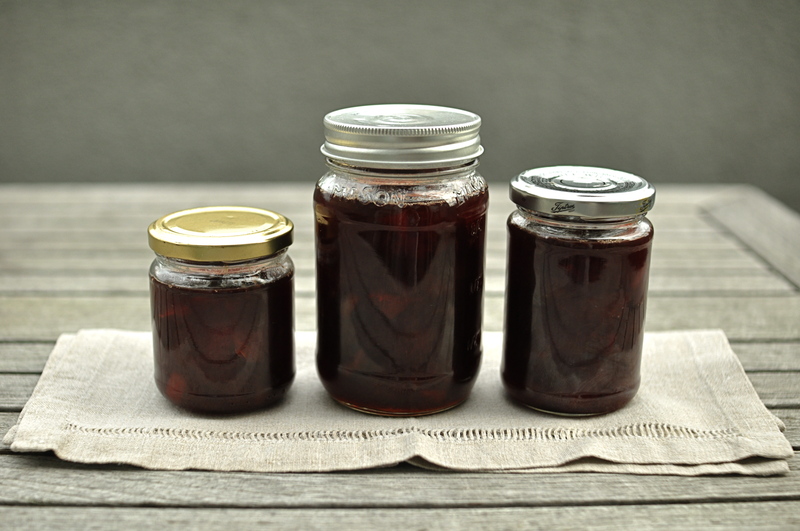 What if I have a little one who doesn’t like chunks of fruit in her jam or jelly? Is there a point where I could puree the jam using my immersion blender? Yes, of course. You may even want to peel the plums first, then puree them directly in the saucepan before mixing in the sugar and lemon. You could even include the candied ginger so it is pureed also. Love the idea of using candied ginger as we always have tubs of it laying around. What’s with the dodgy prunes this season? Nice easy recipe, what is your favourite use? Thank you – I think the best use is probably simply spread on toast, though it might also go well as a condiment for a savory dish, given the ginger.